Finding parking is damn near impossible in New York City. That sounds like an exaggeration, but it's not. Especially in Manhattan. Especially on the Lower East Side. 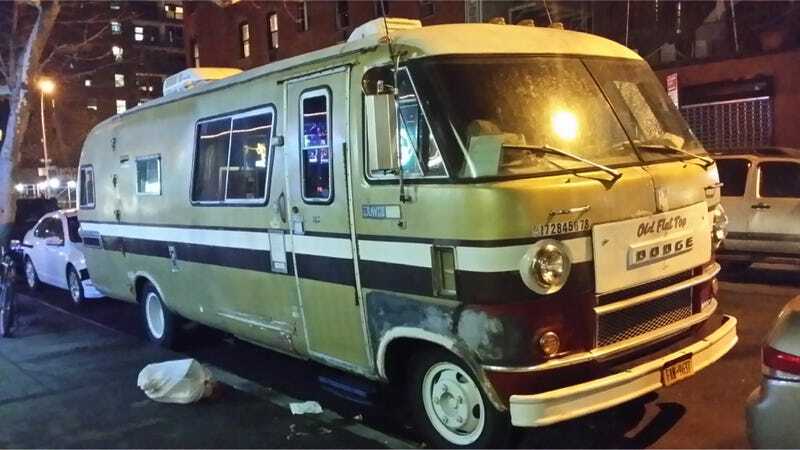 Especially when you're driving a 1971 Dodge Travco Motor Home, nicknamed "Old Flattop." And it's got the 413 cubic-inch V8, which pumps out somewhere around 375 to 400 horses. But somehow, the owner managed to squeeze it in, and he even claims it's "no problem." Which is most certainly impressive. The Dodge Travco was originally built in the early 1960s, and lasted all the way until the 1980s. Though you don't see many on the roads, there's something particularly iconic about its sleek design. It's almost like a self-propelled Airstream trailer.